For a long time I have been intrigued by the exquisite marbled patterning on the blades of antique swords and daggers, and wondered how this was achieved. 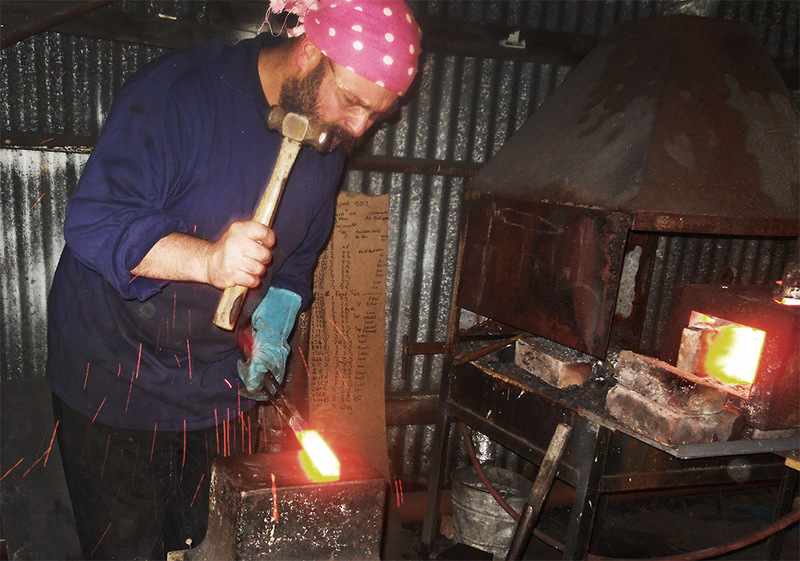 Surfing online to see what I could discover about the technique, I came across the website of Owen Bush, a blacksmith and bladesmith who makes historic swords and axes. He also runs regular workshops to teach people how to make blades and how to do pattern welding – how could I possibly resist?! As with most dedicated metalworkers, one gets a sense of real passion for the craft – the caption on Owen’s website is “Forging Soul into Steel“, and the beautifully presented examples of his work show exquisitely crafted works of art. 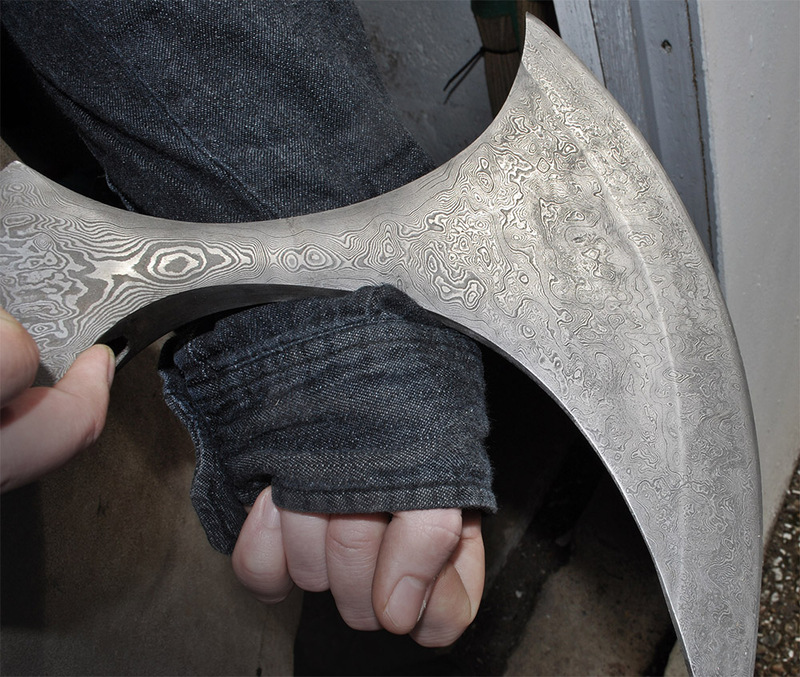 During the workshop he showed us some of his work, including this elegant Dane axe, with a random marbled pattern. The technique that he uses is also known as Damascus Steel. Twisted and folded layers in plasticine, the internal patterns revealed by slicing at different levels. The strong and flexible material for swords and blades is made of alternating layers of different types of steel, forge-welded together, then repeatedly hammered out and folded to create a thin, many layered billet from which the final object is crafted. The repeated folding and hammering compresses the layers; it is this that creates the patterns when the material is ground down to shape the blade. 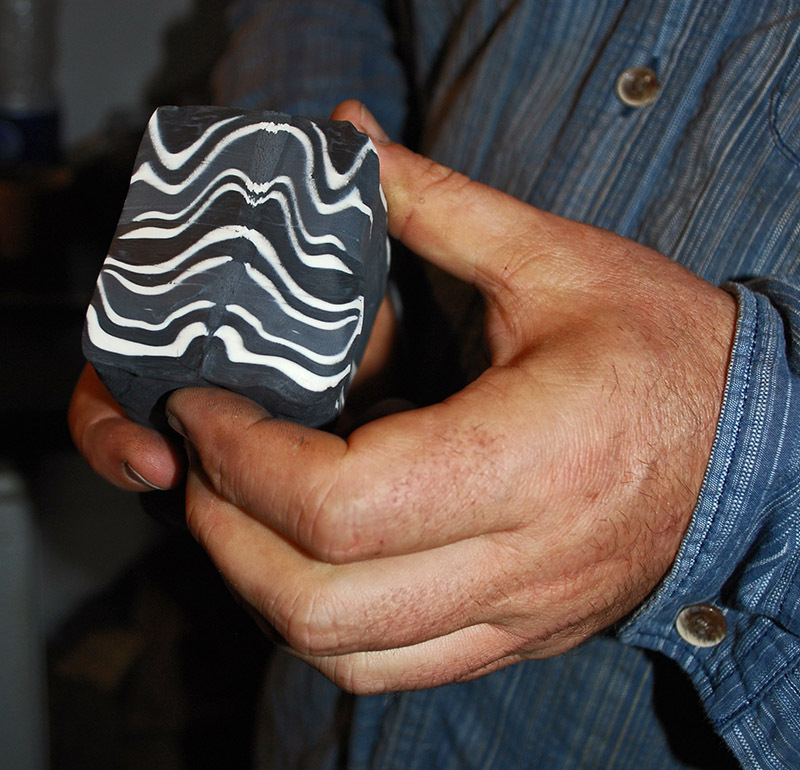 Before we started working with the steel, Owen demonstrated this principle using layers of black and white plasticine. Different kinds of patterns can be achieved by twisting the steel, and also by cutting the billet at different angles. A finished billet contains infinite potential variations within it, which are revealed by careful and considered grinding away of the material. The next stage was to work with steel, learning the technique of forge-welding. We had small plates of two kinds ofcarbon steel, one containing magnesium for the darker layers, and the other containing nickel for the brighter layers. We started by stacking together five alternating layers of these plates, first making sure that they were rubbed free of any traces of oxidation. The layers were lightly pinned together with MIG welds, and mounted on to a long steel handle for working. Introducing the stacked steel with borax into the forge. The stack is sprinkled with Borax which acts as a flux during the forging process, then gradually introduced into the forge to reach the correct temperature. Owen explained that the forge must reach a point where is glows light yellow – that is well over 1000 degrees centigrade – and the steel is only ready to forge when it reaches the same colour. The forge must have as little oxygen present inside it as possible – so the flames sweep out of the opening seeking more oxygen – this is poetically known by some craftsmen as ‘dragon’s breath‘. Oxidation is the enemy of successful forging, and so must be avoided as far as possible. Once the steel is glowing pale yellow, it is taken out and beaten hard on an anvil to expel the melted borax and weld the layers together. You only have a few seconds for this magical moment of fusion to take place before the steel has lost its critical forging temperature and has to be heated up again. 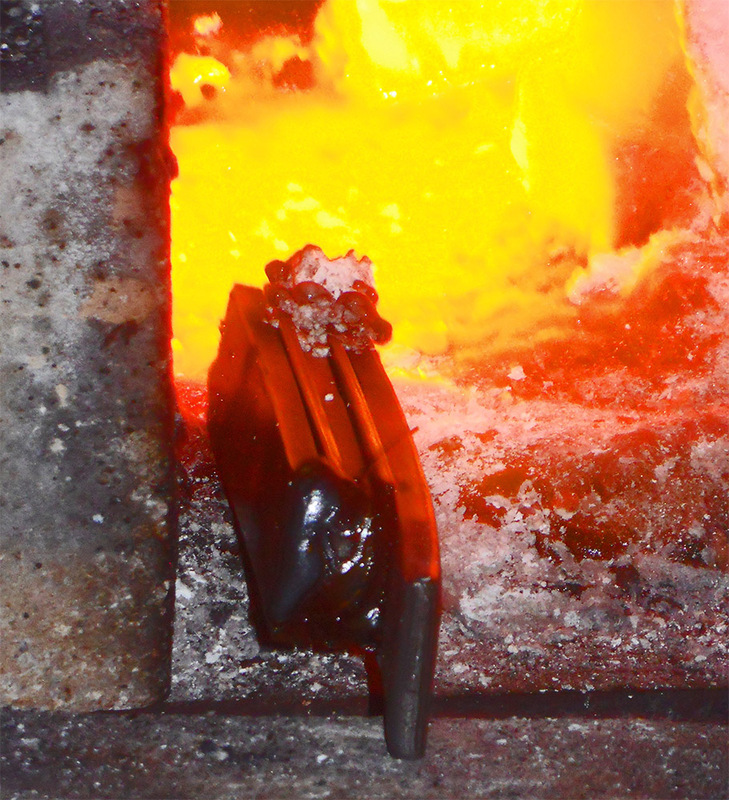 I found the hammering rather arduous, and I was somewhat humbled by the skill and power of my fellow participants – strong young men who had already learned blacksmithing skills. We also used a power-hammer which was marvelously effective, but an utterly terrifying monster of a machine! And it was very exciting to be working in a real blacksmith’s forge, learning the mysteries of this ancient and arcane craft. We hammered out our first piece into long bars which we twisted to create a kind of star pattern. 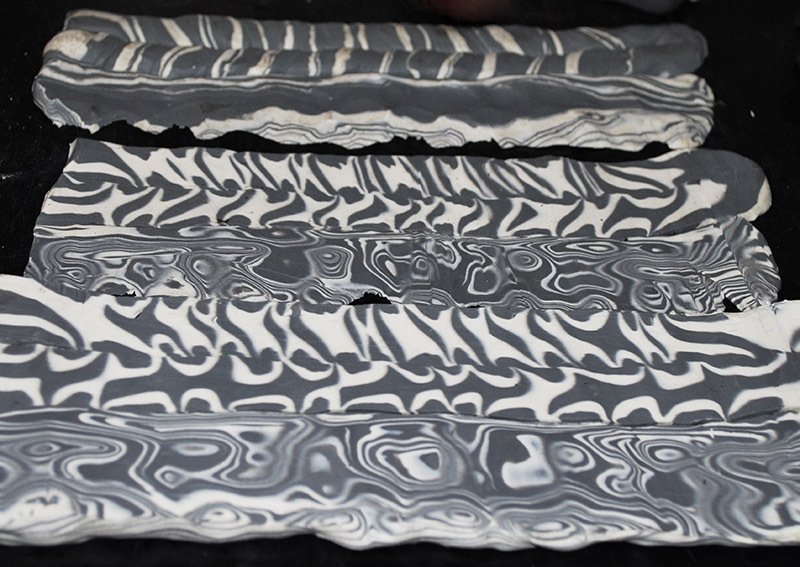 The second forged billet was repeatedly scored, folded and re-forged, exponentially doubling up the layers until the finished billet contained over three hundred compressed layers – this is what makes the complex marbled pattern that you see above in Owen’s beautiful Dane axe. I think this process also increases the strength and flexibility of the weapon, which may have been the original reason for the layering. My billets after a spell in the acid etching bath – the twisted steel reveals an interlaced star pattern on the left, and 360 folded layers reveals the marbled pattern on the right. 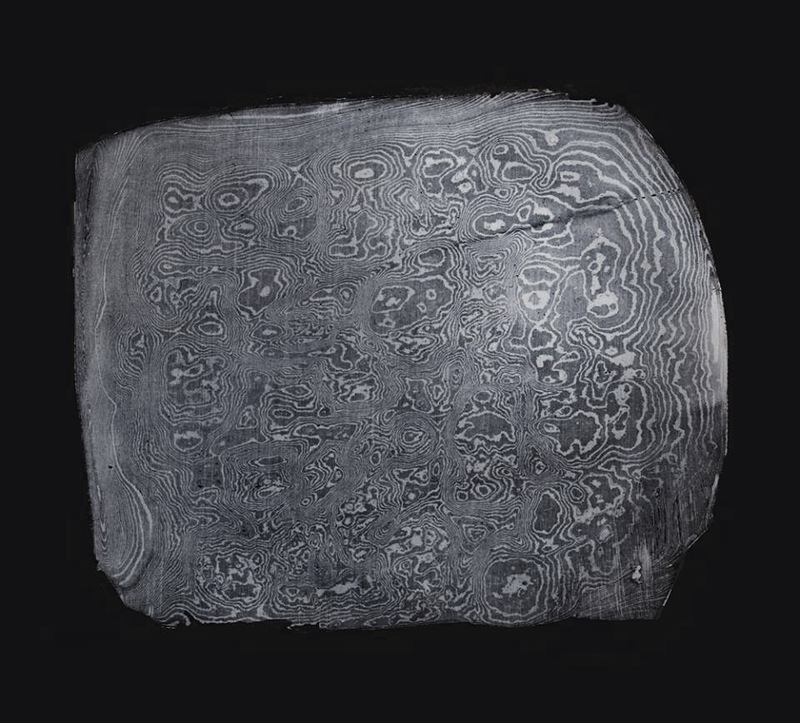 Once the billets have been hammered out and completed they are allowed to cool slowly, after which the oxidized surface is ground down to reveal the pattern-bearing layers. 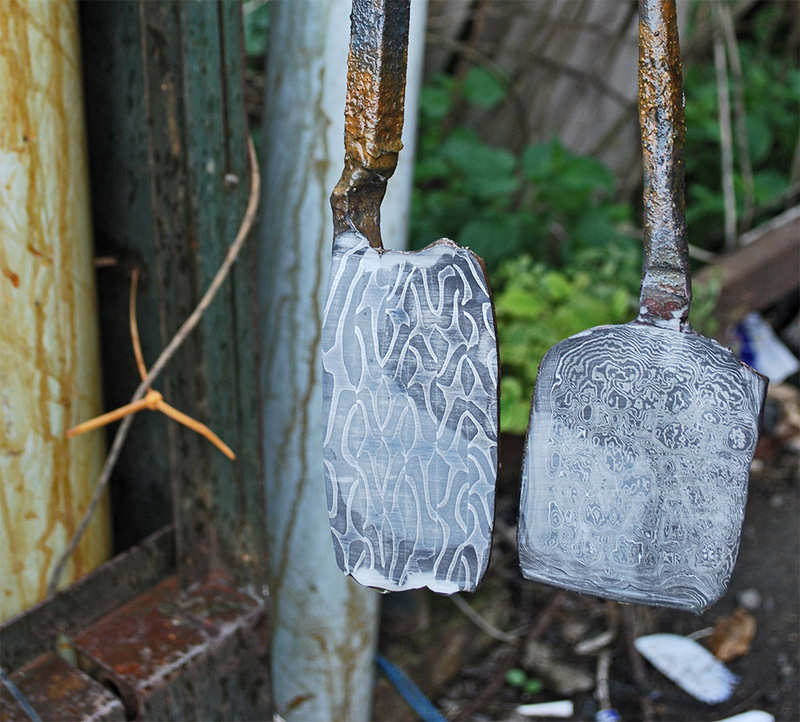 The patterns are only truly visible after the final stage of preparation – etching the piece in Ferric Chloride. This darkens and slightly reduces the magnesium bearing layers on the surface, thus making visible the patterns created by the alternating layers of steel. Very neat stuff! I’ll have to check out his work. I’m love pattern welding, and want to take it up soon. But it’s very very different from true Damascus steel. 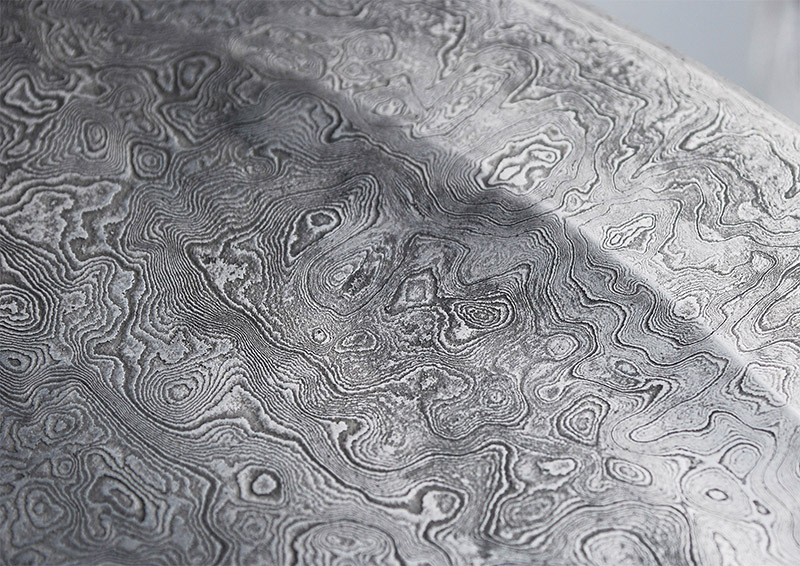 True Damascus has made of wootz steel, and has carbon nanowires and nanotubes in it, from adding biomass and small amounts of alloying elements to the steel during the smelting process. To date no one has ever figured out how to really make true Damascus steel with the same internal molecular structures, sadly. It’d be neat to bring it back. Hi Crystal, Thanks for such interesting comments! Owen Bush did speak of Wootz as something slightly different from the pattern welding he taught us. 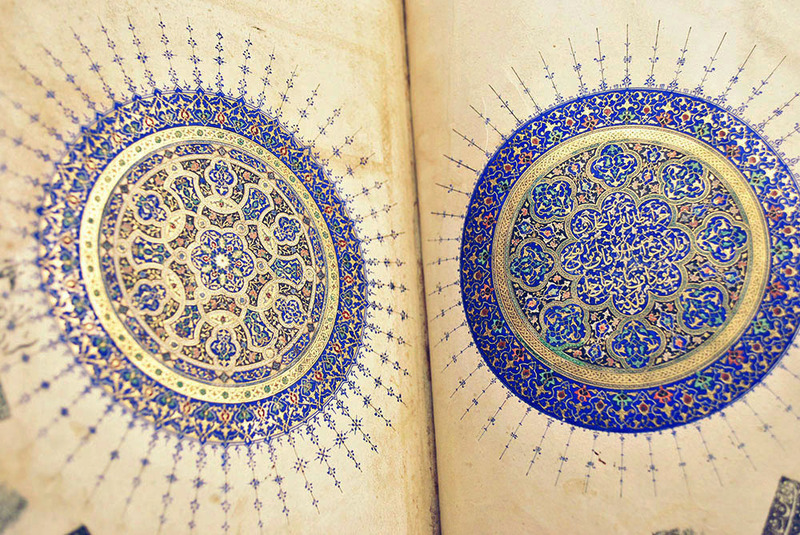 It would be neat to experiment and try to replicate it. 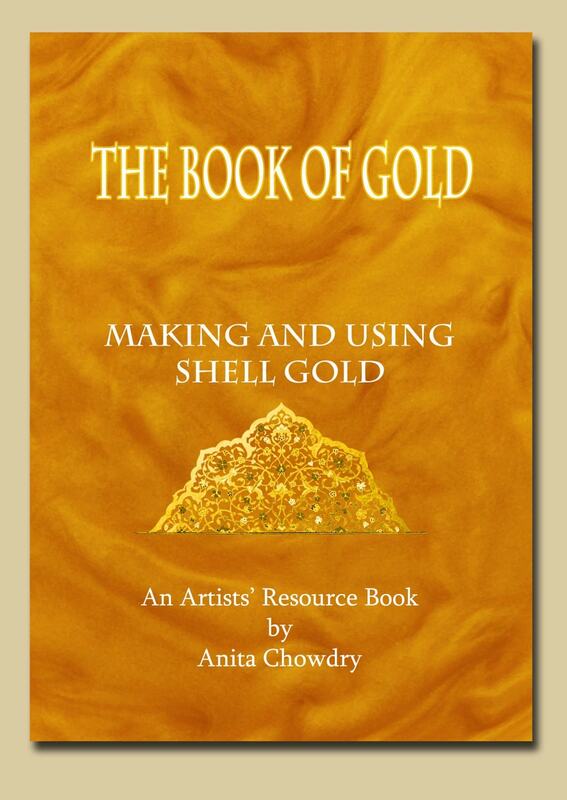 Are you a metalworker yourself? This is fascinating! I will return and read it all again. Thanks for sharing this information.